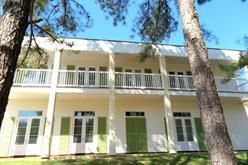 Incomparable paramount plantation home with contemporary style at the heart of Lake Caroline, where the water meets the sky. Situated in a romantic setting showcasing spectacular water views enhancing the home's interior grandeur, the sophisticated showplace was designed leaving no expense spared. Boasting more than 6,200 square feet of living space, the attention to detail, amenities and materials throughout are exquisite. The elegant grand entry features an Austrian crystal chandelier and matching fixtures, soaring ceilings and a picturesque staircase that frame a dramatic foyer leading into an airy open floor plan beaming with natural light and panoramic water views from almost every room of this 3-story masterpiece. The multiple balconies, porches and oversized windows immerse you in a scenic wonderland of unparalleled beauty from sunrise to sunset. This home thoroughly raises the bar for architecture and design and features beautiful hardwood floors and timeless travertine tile throughout. Every square inch is outfitted with an unforgettable blend of style and quality from the gourmet kitchen with top-of-the-line stainless steel appliances, including Thermador and Bosch, granite countertops, custom cabinetry with intricate detail, to the built-in breakfast and wine bars and spacious keeping room and dining room that define an extravagant home. Livability and relaxed luxury were the guiding considerations when designing a truly royal master suite. Escape from all cares in the adjoining private bath whose crown jewel is a spa tub at the hearth of a flickering fireplace. The bath leads into a spacious sauna just perfect for relaxation and rejuvenation. The master suite incorporates only the most accommodating amenities including a separate double shower, double vanities, and his and her walk-in closets with a special shoe closet and linen closet. Offering 5 bedrooms, 4 full-baths, 2 half-baths, a media room with a kitchenette and a mirrored-wall home gym, this enchanting retreat is ready to entertain and host extended family and friends. One bedroom could be a mother-in-law suite and is complete with a separate laundry area. Who says you can't have it all in this exclusive retreat nestled in one of the most prestigious addresses in Madison County? This designer showcase is technology advanced to comfortably and economically control the living conditioned space, the home is equipped with multiple HVAC systems, an intercom system and a security system with motion sensor lights and surveillance cameras. An attached 3 car garage allows for ample space for cars and storage.